Uglyworld #800 - Visiting The State Capitol Building (269-365), originally uploaded by www.bazpics.com. With us reaching the milestone of the 800th image in my "Adventures In Uglyworld" set, the gang of adventurers decided that it would be cool to celebrate the event with a group shot. 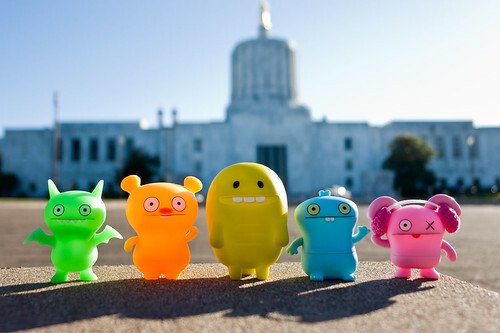 Turtle, Trunko, Ice-Bat, Babo and Ox all lined up in front of the State Capitol building in Salem, Oregon to have their picture taken, with the only one missing from the group being Cinko who had been car sick almost the whole way home from Boiler Bay where we made him pose for photographs by the huge waves which crashed against the rocks. I had hoped to be able to say that this time next week I'd already be back in Aachen with Mireille too, but it's looking like I'm going to end up being extended even longer out here in Oregon! Hopefully I'll know for definite by the of Monday as it's such a pain trying to make any kind of plans at all when you're not sure where you're going to be.